How’s it work? 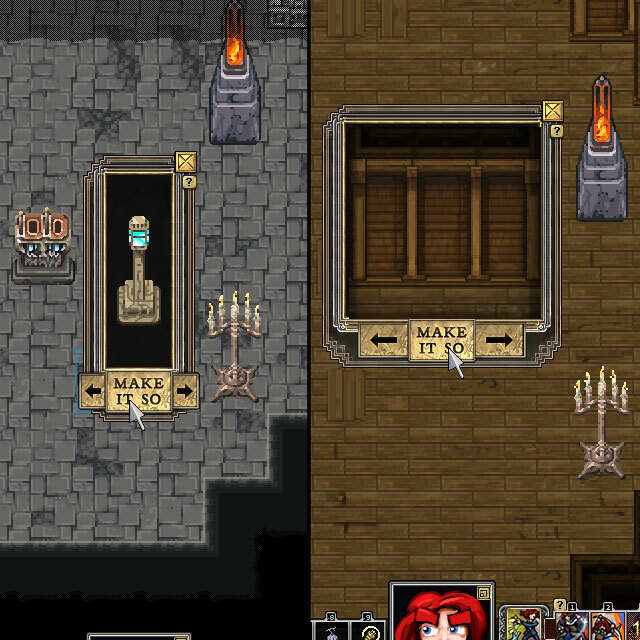 Simple: find some keys to the pocket dimension that a sodden wizard left in the dungeon (the game will make sure you keep finding keys until you pick the stupid things up). Once acquired, a new UI element appears which allows you to jump into the pocket dimension as if you were using a skill. Where'd all the wizards get off to anyway? And why did they leave all their booze behind? Like a skill, this dimensional key has a cooldown. When you return from the Pocket Dimension back to the dungeon, you will appear in the same space. Note that time and magic work differently and handwave handwave cough something or other so you can’t heal or digest food and booze in the pocket dimension or otherwise exploit it to get out of trouble. Unless you go from the Pocket Dimension to The Wizardlands. But that has risks of its own. But let’s back up a bit from all that and talk about limited inventory space. Inventory has been a problem in Dredmor forever. This is of course a game based around finding piles upon piles of silly objects in the grand tradition of looting that made games like Diablo strangely compelling. We need the multitude of items for the sake of the act of looting as well as to be a vehicle for delivering so much of the humor and backstory – such as it is – of the Dredmor universe. In short, Dredmor wouldn’t be Dredmor without all the useless crap lying around. 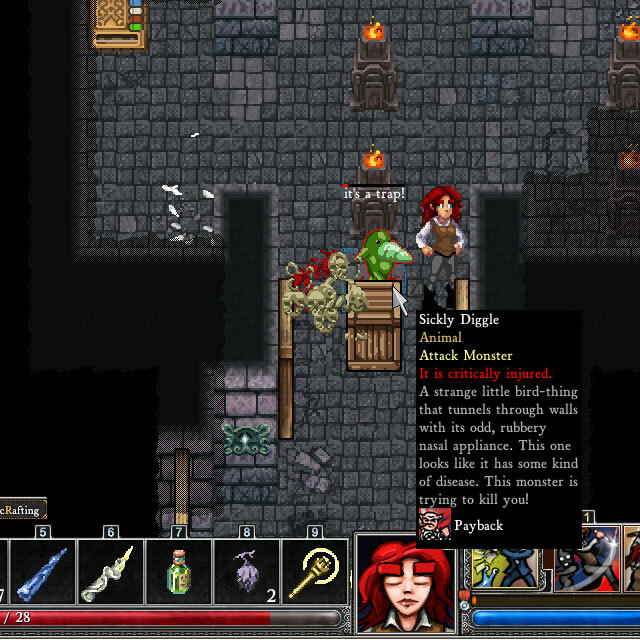 Players, however, tend to be driven rather mad by the highly limited space in their inventory, and quickly, as it can be filled up within the first dungeon level. People write us letters about just how awful this is, trust me, and we read them. Yes, we could just make the inventory infinitely large. But this creates a few problems: of UI implementation (which can be fairly simple, if potentially tedious to use), and of gameplay balance (which is not so simple). Apart from skills & spells, items are the solutions to problems met in the course of gameplay, so allowing the player to hold every single item in the game means they can solve any problem in the game by shuffling about in their bag and pulling out the magic wizzawoozle. Worse yet, this makes every game of Dredmor rather similar by allowing the player every option at the same time rather than forcing them to make choices about what they will take with them and what they will leave. Take the wizard hat OR the knightly helm, not both. 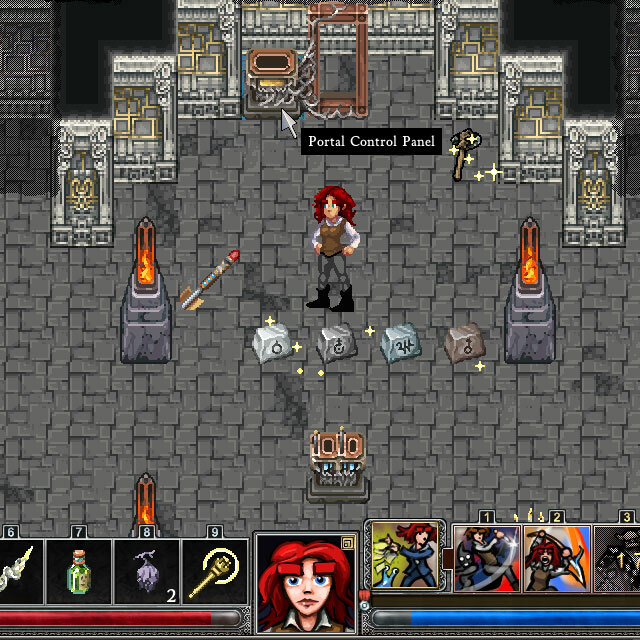 Ideally the player has to make hard decisions about the set of solutions they will have on-hand to deal with the dungeon. 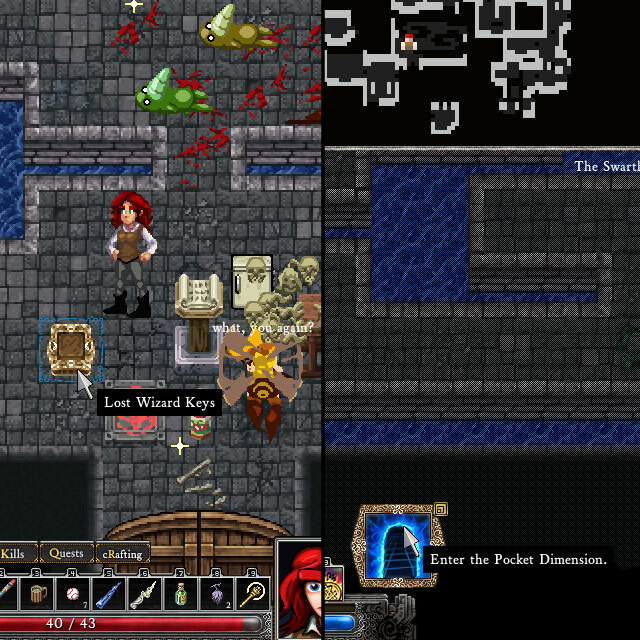 See for example our 7-skill system that both limits and enables gameplay (– far more elegantly than our limited inventory system, I must concede). So: The Pocket Dimension gives you an effectively infinite inventory with the gameplay-relevant friction of a 32 or so turn cooldown on using the portal key. At least it's MY clutter in here. 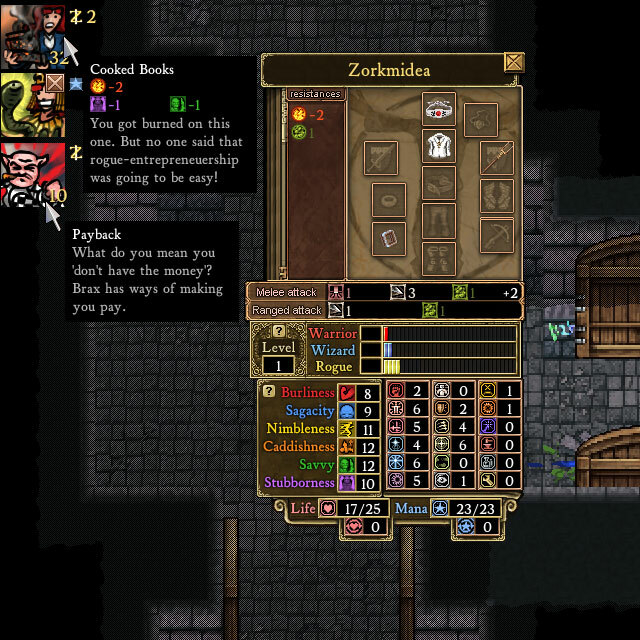 First, it lets the player customize their own space in the game in a small way. Do you like candles? We can do candles. Do you like piles of bones? We’ve got those too. You can change the tileset to your favourite level, from The Fungal Halls to The Subterranean Forest (including a few new tilesets only found in The Wizardlands, which is a subject for another post). Ah, but the catch, and the second point: This encourages player investment in the game beyond just that of each individual character. You must earn each piece of decor and each tileset by visiting the level on which they appear. These will be retained for the instance of the game, meaning that when you start a new character they will have the decor you’ve earned with other characters — and your pocket dimension will retain its decor. This goal of encouraging player investment in the metagame goes in-hand with the expanded Menagerie, Trophy, and Achievement screens that will become accessible through the main menu. It wouldn't be yours if you couldn't change the wallpaper. Daggers and Polearms do look very cool, and will be changing up how weapon skills work in Dredmor, but they’re fairly straightforward problems. The Bankster, on the other hand, makes things weird. The Bankster is, naturally, a rogue class skill but acts a bit like a wizard in that it uses a resource to create spell-like effects. This resource is of course Zorkmids aka your money. For those really just interested in Polearms and Daggers you can see their skill lines at the top of my skill tome here. Lots of neat stuff going on like mutually exclusive fighting stances and ... a secret thing that Mr. Whitman is finishing up just today actually. Upon entering the dungeon, you tend to be absolutely broke. For a Bankster, this is not a problem at all: you can take out a High Interest Loan from Brax to fund your start-up. Careful though, there’s a good chance you’ll get the Bad Credit debuff after taking out a loan and this will make future loans and use of Bankster skills a bit risky. Let’s talk about that risk. Zorkmids are life and death to the adventurer-entrepreneur. An Egyptian Magic buff slipped into this screenshot as well, in case Dagger and Polearms weren't doing it for you. Using any Bankster skill has a chance to cause one of a set of Bankster-themed debuffs, currently “Cooked Books”, “Frozen Account”, “Poor Investment”, and “Bad Credit”. Each reduces a few primary stats and will cost you zorkmids as upkeep each turn. 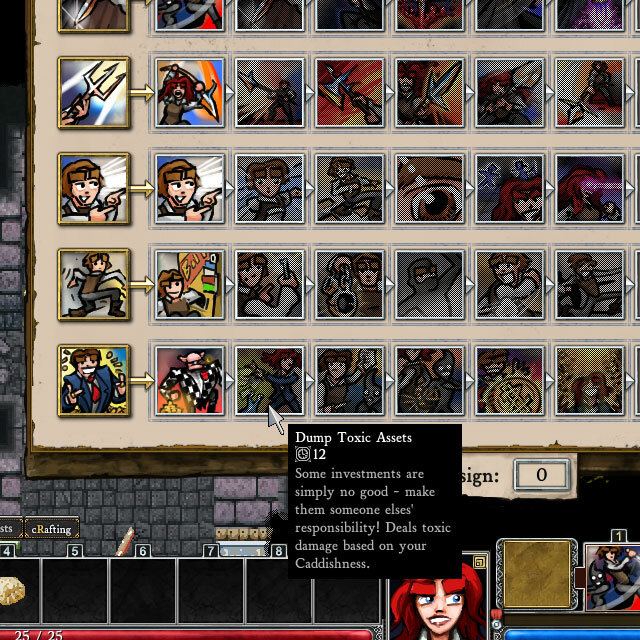 Further, having Bankster debuffs on makes it more likely that even more debuffs will appear as you use the skills. It’s a risky business, Banksterism. The Bankster’s primary method of getting rid of these debuffs is through the Dump Toxic Assets skill which, for a modest Zorkmid price, lets you externalize costs onto a hapless monster rather than yourself (along with a cloud of toxic gas, for good measure). That's right, sickly diggle: I've got you paying for my mistakes.! So the core mechanic at work is the interaction between your Zorkmid levels and Bankster debuffs. Zorkmids are increased by the dungeon level you are currently on (supply and demand, my friend, supply and demand) and costs are reduced by the core Bankster attributes of Savvy (and their effect occasionally enhanced by Caddishness), but these stats — as well as your Zorkmids — are drained if you don’t manage your debuffs correctly. Insurance Fraud : Take out a policy and reap the rewards as you are beaten to a pulp! Hire Contractor : Charms a monster; bribery is such an ugly word. Fiscal Hedge : Pay Zorkmids to alleviate damage to yourself. And to cap it off, you can use the Bailout when you need to escape from all the consequences of your fiscal, ah, maneuverings. From a design standpoint, introducing a whole new set of mechanics based around Zorkmids to the game is going to be a nightmare to balance (especially when someone keeps leaving Crownstar Addendums in fountains) but we think it’s just too much fun to pass up. We never could cut a good joke. Hence: Dredmor. That Bankster stuff certainly sounds high class. Considering how difficult it sounds, what with the buffs and everything, I hope you’re well prepared for an “Occupy Dungeons” movement. Is it possible to fill my entire pocket dimension with diggle eggs and raise a diggle farm? This is an important question. I don’t care if it’s broken, take my money and give me this DLC! Beauteous. Model of a game update post. Hopefully never. They should make a reference decrying it though. You can do this already; removebuffbyname to remove the other buffs. These buffs use that anyway. Glad to hear about customizing the pocket dimension, since that’ll salve my tendency to look for aesthetically pleasing big rooms to work with and wander back to. Hope you have a post about encrusting, soon. I’d love a more controllable way to boost my magic items, since I get paranoid about Kronging at times. I end up with a lot of materials and nothing specific to use them for. For those of us who craft like crazy miners, having somewhere to put stuff for 4 levels time is going to be a godsend. As long as you guys get making DLC, i’ll keep coughing up the cash, btw. I’ve figured out what Project Odin is! It’s a competitive Diggle-breeding simulator! Guys, I’m literally dreaming about pocket dimensions. I need some help, and soon! Bugger your help. I need Wizardlands. I really hope this extension will be available outside of Steam/Desura, for HiB buyers for example. Out of curiosity, do you have any particular issues with Desura? This is awesome and I need it nao. Inventory management is killing me. I spend more time making lute fisk and listening to “your inventory is full!” than actually killing the monsters. It’s a billion degrees in most of America. PLEASE release this before we burn up! I figured that means you have 2 days to get the expansion out to us all! Words cannot describe how much fun it was to read that post! You guys rock!